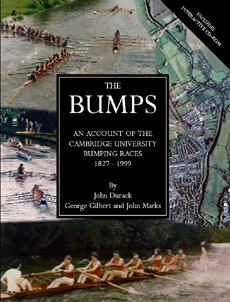 The Bumps is a book with enclosed interactive CD-ROM outlining the Inter-Collegiate Bumping Races that have been held on the River Cam since 1827. It deals, albeit briefly, with the nature of bumping races and their history, including changes in the equipment and dress over the period and the celebrations that have accompanied the races. Whilst individual Boat Club histories are beyond the scope of this work we have also included a brief summary of the origins and progress of each of the Boat Clubs. The accompanying CD-ROM covers these matters and many others in greater detail than would be possible in book form. It also contains charts demonstrating the position of every boat that has rowed in a College bumping race over the whole period and crew lists for those that have rowed Head of the River. These charts form an extensive database of information that can be easily searched enabling particular events and the progress of any crew to be found quickly. Additionally video footage of many aspects of bumps racing and the variation of rowing styles over the ages can be seen along with highly detailed aerial photographs of the river and many hundreds of other photographs. Each year, after the May races, an updated version of the CD-ROM will be available and will expand the software to include all the new bumps charts, crew lists, photographs and race reports from that year.